“When do they stop running the other way when you tell them to come?” my frazzled friend asked me one day. She had just told her three year old to come to her and the three-year-old literally ran in the opposite direction. Sadly, they will not just start listening and obeying at some certain age. The day does not come that your child will just start coming to you when called unless you take some measures to ensure your child will come when called. That means you need to teach your child to come. Here is what you need to know to get your child to come when called. If you frequently give instructions, get ignored, and do nothing to follow through and be sure your child obeys, then you can’t realistically expect your child to listen when you tell her to come to you. So your first step is to make sure you require obedience in general. You want to have clear expectations and clear rules. If your child disobeys, you need a consequence for not obeying you. One of my favorite books for getting in the best frame of mind for correcting children is Parenting With Love and Logic. You can read all about my thoughts on Parenting with Love and Logic here. If you do not know where to start, read up on my Discipline 101 post. Children often need to be taught what obedience looks like. They are not born knowing what is okay and what is not okay. We often forget that as adults. Do the practice at home when you are both calm and happy. You can make it fun. You don’t want the first time your child puts into practice “When I call, you come” to be at the park. You want to work on it at home so you both know she knows what is expected. She can obey. She won’t be perfect, but she can be pretty good. Children live up to expectations. If you expect obedience, your child will be more likely to be obedient. Yes, your child will test your boundaries at times. Make sure the boundaries stay in place so your child knows what they are. This is so simple, but requiring your child to respond with “Yes Mommy!” after you give an instruction will set up your child for success. It is harder to ignore an instruction if you have just agreed to it. Parents often call out instructions without being sure they have attention first. When you want to call your child to you, start with the name. Say the child’s name and wait for a response. When the child has acknowledged you, give the instruction. Bonus points for eye contact if in the same room. You can say, “McKenna?” wait for that “Yes, Mommy.” “McKenna please look at me” and wait for her to look at you. Once she is looking, give the instruction. Over time, your child will learn that you want her to look at you when you give an instruction. This is a great idea in general. It is easier to follow an instruction if your focus is on the instruction. If you are coloring while receiving the instruction, you aren’t going to listen as well. Requiring your child to look at you is helping set your child up for success. Also, think of what a benefit this skill will give your child in the long-term perspective of communication skills! Eye contact is so valuable to have. Say, “Brinley…. [yes mommy! ]…come here please.” Not “Brinley…. [yes mommy! ]…Time to come here, okay?” or “Brinley…. [yes mommy! ]…will you please come here?” Do not ask a question unless you are okay with a “No thanks!” response. The issue is the “will.” Will you please come here? Nope! 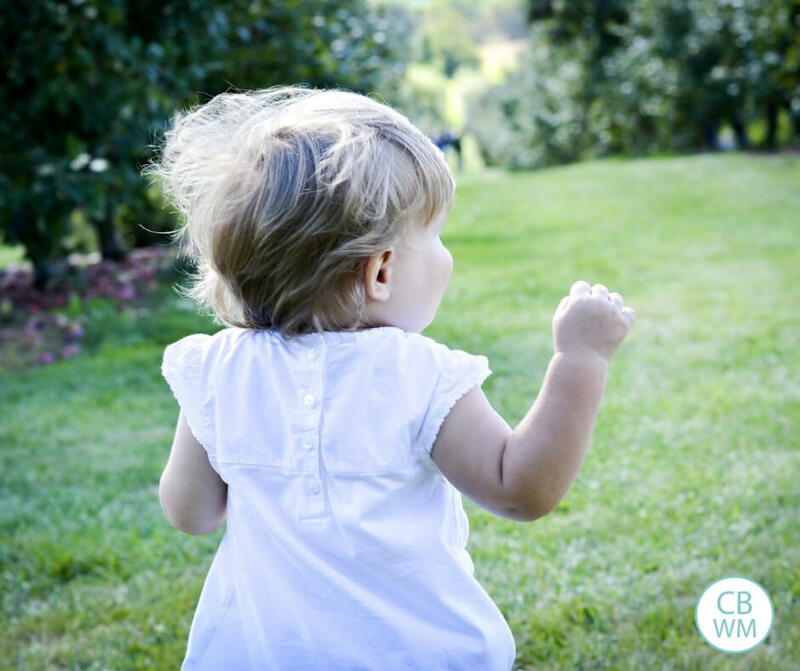 When your child comes when called, respond with a “Thank you for listening to mommy!” This adds positive reinforcement to your child, which is super powerful for helping your child learn and practice appropriate behavior. 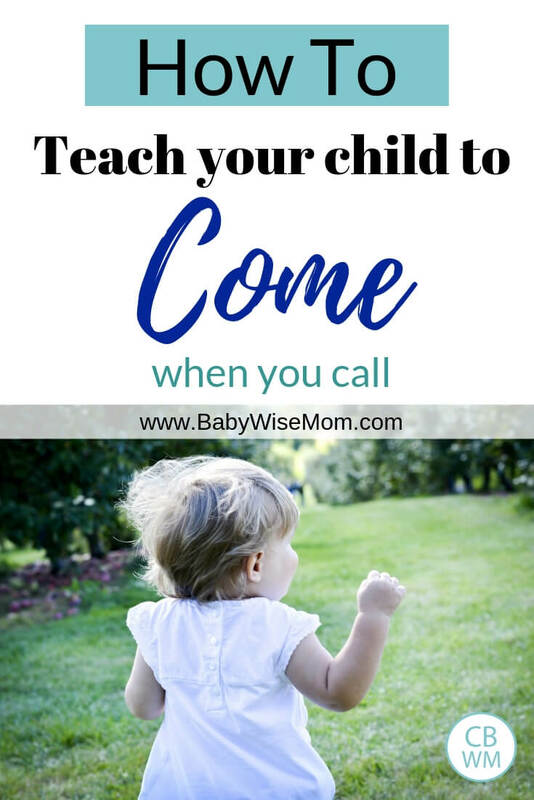 You are working to teach your child to come when you call, so you want him to learn that coming when called is a positive experience. You want to have a consequence when your child doesn’t listen. It could be a timeout. It could be the loss of TV time that day. It might be the loss of the toy that is distracting her. It might mean she doesn’t get to walk herself and has to be carried. For some children, a stern look might be enough. Be consistent and be sure your child’s behavior changes in the future. If you don’t see a change in the negative behavior, your consequence isn’t working. You need to find what works for your child as far as consequences go. Try different things until you find your child’s currency. Children are little scientists. They are the best kind of scientists. They aren’t looking to sway the results in any direction; they only want the truth. They just want to know what makes the world tick, and you are a huge part of that world. You will be tested again. The more strong-willed child will test more frequently than the super obedient child. Just keep at it. 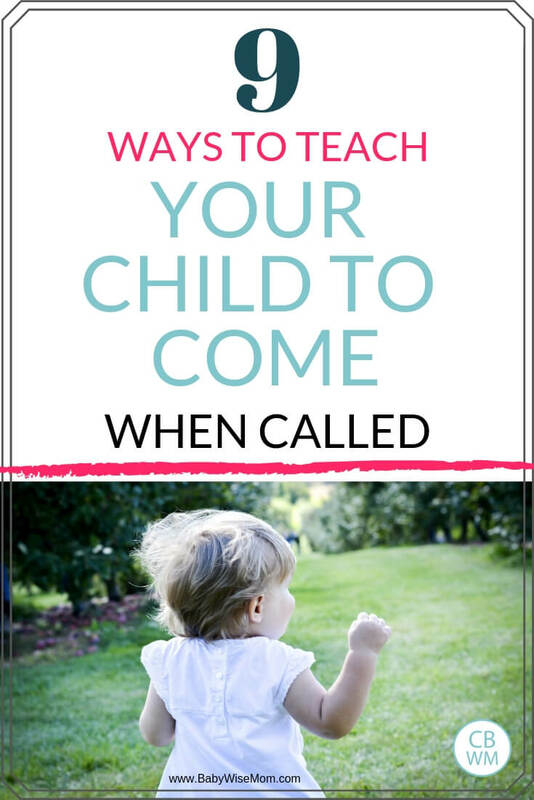 These tips can help you teach your child to come when called. It takes teaching, patience, time, and consistency, but you can get there!